How Much Merrick Dog Food Should You Feed your Pet? Are you thinking of feeding your dog with the products offered by the Merrick brand? Then you are on the right track, as this brand receive, positive reviews from dog owners. If you are a dog owner and you are eyeing the products of the brand, then aside from the prices, one factor you may have considered is how much you will be feeding your pet. In this case, this article can help. 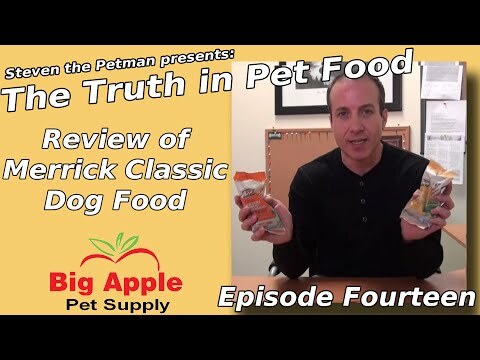 It answers the question, “Merrick Dog Food – How Much to Feed?”, giving you an idea about the safest amount you should let your dog consume daily. Merrick is a trusted brand of dog food that has been in business since 1988. It has built a good name as a high-quality pet food company. It started as a family-owned business, founded by Garth Merrick. In 2015, the company was purchased by Nestle-Purina. Even with the new ownership, the brand continues to produce products similar as when it started. With slight changes to improve the quality of the products, you will still notice the Merrick mark right away. One reason behind the popularity of Merrick is that most of its products are more affordable in comparison to other high-end brands. The fact that Merrick uses human-grade ingredients when making their foods also guarantees its products are safe for dog’s consumption. In addition, the brand makes it a point to provide its consumers a wide variety of product options. You can find a lot of grain-free choices from the brand. However, note that Merrick has not completely gone grain-free, as it still offers products with grain in them. They also believe it’s not actually inherently wrong to feed dogs with foods containing grains. Some even survive well when consuming grain-based foods. Just make sure your dog can thrive on foods with grains before you purchase such product from Merrick. Another fact about the dog foods offered by Merrick is they are guaranteed to offer a high level of nutrition. It contains healthy ingredients. The wide range of products also makes it possible for you to pick one that perfectly suits the size, weight, and breed of dog you own. The products also make use of healthy ingredients. Some commonly used ones are deboned chicken, chicken meal, turkey meal, sweet potatoes, peas, salmon meal, apples, and flaxseed oil. Merrick makes it a point to use only ingredients that are locally sourced from ranchers and farmers. The brand does not use any ingredient taken overseas. Such guarantees the freshness and quality of the ingredients. Aside from ensuring the dog foods they offer are produced in-house, Merrick also makes sure they follow the strict standards implemented by the Food and Drug Association (FDA). Merrick is known for having its own 5-star kitchen, as well as high-quality manufacturing facilities, making it possible for them to produce only the healthiest and safest dog foods. You can expect most dog foods from Merrick to be free of ingredients that are harmful for dogs, including artificial colors, flavors, preservatives, fillers, and by-products. All the ingredients used in it are one hundred percent real, specifically for the meat. Merrick continues to deliver high-quality products, as they spent years conducting research related to nutrition, as well as taste tests. They do that to ensure they continue to manufacture recipes that contain the healthiest and safest ingredients possible. The goal of the company is to produce dog foods that are rich in nutritional benefits and will never compromise the overall health of dogs. That’s the reason behind the long years they spent on research and taste and lab testing. Merrick dog food: how much to feed your dog? Now it is time to give you answers to that question. Note that the amount you will feed to your dog will depend on the specific product you buy, as well as the dog’s size, weight, and breed. To give you an idea, here are some of the most popular Merrick dog food products and feeding guidelines. This grain-free dog food recipe is designed for adults. It contains around 70% meat ingredients. The remaining 30% is composed of plant-based ingredients and essential vitamins. It is rich in healthy carbs derived from sweet potatoes. The addition of sweet potatoes makes this recipe more flavorful and healthy. The meat, which is a great source of protein, is made of fresh chicken and chicken meal. This product is also rich in healthy fats that are essential in ensuring your dog will stay in his best condition. It also contains high levels of Omega fatty acids, such as Omega 3 and 6. The product also has chondroitin and glucosamine. Regarding how much you will feed your dog, it will depend on his weight. For instance, if he is around 10 lbs., then he will need around three-fourth cups of the product. If he is around 40-50 lbs., then you may need to feed him around 2 to 2 and ½ cups of this grain-free product. For a dog who is around 100 lbs., he will need around 4 and 1/3 cups of this product. If he is more than a hundred lbs., you’ll need to add one-fourth cup for every additional 10 lbs. of bodyweight. Another grain-free dog food for adults offered by Merrick is the real rabbit and chickpeas variety. Just like what has been mentioned in the product name, it does not contain grain, making it safe for your dog. It also primarily uses real deboned rabbit for its ingredients. This makes the protein content of the recipe high. Unlike the previous product, this does not contain any potato. It features chickpeas, instead, which can help those who are in search of a low-glycemic option. Another reason to love this product from Merrick is it contains other healthy ingredients, like farm-fresh fruits and veggies. You can expect the product to contain blueberries, peas, apples, and a lot more. It is also rich in Omega-3 and Omega-6 fatty acids, which help maintain the excellent health of your dog’s coat and skin. With the high chondroitin and glucosamine level of this dog food, you have an assurance it also aids in maintaining healthy joints and hips. It is free of soy, wheat, corn, and gluten – all of which might harm your dog. As for feeding, the amount per serving will depend on your dog’s weight. If he is 10 lbs., then it is highly recommended to feed him around 1 cup of this dog food. Dogs who are around 30 lbs. require around 2 and ¼ cups. A 100-lb. dog needs a higher amount of this dog food, around 5 and 1/3 cups. If he is more than a hundred pounds, then it’s also necessary to add one-fourth cup to the recommended amount every additional 10 lbs. Designed for all breeds and life stages, it is safe to say this is one of the most versatile dog food products offered by Merrick. What’s good about this recipe is it comes in a flavor that your dog will find hard to resist. That said, you have an assurance he will enjoy it. It contains a mixture of premium proteins with egg product and dried peas. The fact it is grain-free and does not contain any gluten also makes it suitable for dogs with dietary sensitivities or food allergies. Such formula also makes it much easier to digest. It mainly uses deboned beef for its ingredient, making it high in protein. It also contains beef liver. This product is designed to let your dog enjoy a hearty, savory, and palatable stew. You can also serve it as a complete meal since it has a balanced and complete nutrition. Again, the feeding guidelines will depend on your dog’s weight. A 10-lb. dog requires around 1 and 1/3 can of this product. For a 30-lb. dog, around 3 cans of it would be enough. If your dog is around 50 lbs. in weight, then you will need to feed him around 4 and ¼ cans daily. A 100-lb. dog requires 7 and ¼ cans of this delicious dog food. Another product that is worth checking into is the Merrick Classic Small Breed. One of the major benefits of this dog food is it offers a high level of natural nutrition by ensuring it contains a wholesome balance of whole grains, protein, fruits, and veggies. It uses real, deboned chicken, making it capable of giving a good supply of protein. It also contains peas, apples, and carrots. It also uses a formulation composed of essential vitamins and minerals, making it possible for your dog to receive a well-balanced and complete nutrition. In addition, it can help improve the mobility of your dog, because it is rich in chondroitin and glucosamine. The fact that it is rich in Omega-3 and Omega-6 fatty acids also makes it effective in promoting a shiny coat and healthy skin for dogs. It is potato-free, which is a good thing if you are looking for a dog food with a lower glycemic index. As mentioned, it is mainly designed for small dog breeds. A 5-lb. dog requires around ½ cup of this Merrick dog food. If your dog is around 20 lbs., then you will need to feed him around 1 and a ½ cup of the product. For 30-lb. dogs, around 1 and ¾ cup of this recipe will be enough. Dogs who are more than 20 lbs. need to be served one-fourth cup more every additional 5 lbs. of bodyweight. If you still have a puppy, then the Classic Puppy recipe from Merrick is ideal for you. This recipe is designed to meet the requirements of puppies for healthy fats and high-quality protein. With that in mind, it is not surprising to see it using real chicken with whole grains, fruits, and veggies. Such provides the right balance of nutrients designed to support your puppy’s overall health and well-being. Aside from real, deboned chicken, an excellent source of protein, it also contains amino acids that promote a healthy metabolism, while helping your puppy build muscles. It also contains DHA designed for healthy growth, as well as chondroitin and glucosamine, which are helpful in maintaining the excellent joint health of your dog. Feeding your pup this recipe will also depend on his weight. For a 6-lb. puppy, around 1 and ¼ cup of this product will be sufficient. If your puppy is already around 20 lbs., then you will need to feed him 3 cups of this dog food from Merrick. Dogs who are around 50 lbs. need 5 and ¾ cups of this recipe. Merrick dog foods are among the top-quality products you can feed to your dog. Just make sure you are aware of the body weight of your dog and his present life stage, so you can figure out which one among the brand’s products fits him well. Also, figure out the exact amount you should feed him to prevent the risk of overfeeding. How Does Beneful Dog Food Rate?